Leo and Claudine Amery invite you to participate in six day stained glass courses this year. These courses are designed to suit both beginner and advanced participants. Set in the stunningly beautiful landscape of the Dordogne valley in the Lot departement of France, you can make full use of the artist’s large studio facilities, whilst enjoying the delights of a region of France famous for its food, wine and countless sites of historic interest and natural beauty. Leo Amery has a long experience of teaching stained glass first in adult education with ILEA, 1984-1987 and subsequently privately. Since 1994, Leo has run several one week long summer courses a year from his studio in the heart of the countryside in SW France. Leo also runs	a course in the spring one day a week for six weeks. Each course is designed for a minimum of four and a maximum of seven people. At least six hours of tuition a day will be given though participants are welcome to use the studio more or less than this as they wish. Participants are encouraged, where possible, to bring precise dimensions of a window destined for their stained glass panel. 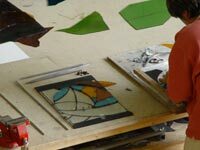 The introductory course is designed to explore individual creative potential through the design and fabrication of a stained glass panel. For beginners : design, choice and use of glass are given particular emphasis. Time permitting the course will also cover copper foiling and basic glass painting techniques. No previous experience of glass design or painting is necessary. For advanced participants, we start with a structured exploration of different potential treatments to glass (glass paint, silver stain, acid etching and sand blasting), with particular emphasis given to glass painting techniques. The rest of the course will be used to design and make a panel incorporating these techniques, and to challenge the initial creative process, approach to design and look more closely at colour and its uses. Bring your camera. It can be a good way of recording different stages of the technique. Please arrive between 6.00 PM and 7.00 PM on the first evening. The course will finish by 5.00 PM on the last day though participants wishing to stay that night may. The property consists of a stone built farmhouse, guest house, barn and brand new studio set in fifteen acres of land on the northern slopes of the Dordogne valley. Lovely local walks reveal spectacular views of the Dordogne and the south facing house has stunning views across the valley to the Causse de Gramat. Participants will have their own rooms or be asked to share with one other, depending on numbers. The house is four minute drive from the medieval town of Martel and close to many historic and natural sites, such as Padirac and Rocamadour. Breakfast and lunch will be offered throughout the course, and dinner on the evening of arrival. Lunches will be good food, healthy and traditionnal, i.e. cold meats, salads, pâté, cheese, fruit etc… After the first evening we can explore the excellent local restaurants as a group or individually or you can buy food and cook it at home, i.e.do as you please. If you do have any particular likes or dislikes on food and drink please let it be known in advance. Should you feel like bringing a local speciality from your region, to share whilst on the course, please feel free to do so. Fees for the six days course are 580 euros. There is an additional charge for materials depending on the quantity and quality used (approx. 70 euros	for a 40x40 cm panel). A deposit of 180 euros is required	on confirmation	of booking. If you want to book on a course, go to contact. Participants should make their own holiday insurance arrangements if desired. Leo cannot accept responsability for damage to or loss of property, or for personal illness. Trains can be met at St-Denis les Martel, (taking a train from Paris and changing at Brive la Gaillarde) or Souillac. Please bring a large enough board or rigid packaging material to transport	your window in total security for the return journey. Remember, to bring : work clothes and plenty of enthusiasm. Please do not hesitate to get in touch with Leo if you have any further questions. He can be reached directly in France at Bagadou Bas by telephone, letter or email. Remember places are limited, so if you are interested please phone or write as soon as possible. There are many wonderful medieval villages in the area. Each with their own individual personality. "The town of seven towers" is five minutes away by car. Visit the Tourist office web site. The famous village Collonges la Rouge is only 15 minutes away. Visit the Visit the Tourist Office web site .